On Monday's CBS Evening News, anchor Katie Couric filed a report on Senator Lisa Murkowski in which she highlighted the Alaska Republican's criticism of the Tea Party movement requiring a "purity test," and of Sarah Palin being "not worldly enough" to be President. After describing Murkowski as "one of a dying breed of moderate Republicans," without noting that Tea Party Republican Joe Miller was dragged down by personal scandal, Couric passed on that "Murkowski claims she's winning because she represents all Alaskans." A clip of Murkowski complained: "I do not pass the purity test that the Tea Party has set out. ... But I don't think most people in my state pass that. There's a lot of people in Alaska that are pretty anti-government, but I think they would also agree that, well, maybe the best thing is not that we shut government down." KATIE COURIC: And, she says, the message she's hearing loud and clear is compromise. LISA MURKOWSKI: I will tell you, I am not one of those who wants Obama to fail. If he does well, that means the country's doing well. We don't have time as a nation to spend all of what we do blocking. We have got to figure out how we get to a point where we can be sitting around the table and talking about these difficult problems and advancing some solutions. The CBS anchor then turned attention to Murkowski's negative views of Sarah Palin and seemed to suggest that Palin was bitter about not being appointed to the Senate by Murkowski's father, former Governor Frank Murkowski. Couric: "She's not shy when it comes to speaking out about another Alaskan outdoors woman, but minimizes the bad blood created when her father appointed her instead of Sarah Palin to serve out his term in the Senate." Couric continued: "You have said you would not support Sarah Palin for President because she is not worldly enough." Then came a clip of Murkowski bashing Palin: "I just do not think that she has those leadership qualities, that intellectual curiosity that allows for building good and great policies. You know, she was my governor for two years, and I don't think that she enjoyed governing." KATIE COURIC: In Alaska, they're still counting votes in the Senate race. Tea Party Republican Joe Miller leads with 87,000 votes, but incumbent Republican Lisa Murkowski, who ran a write-in campaign, trails by fewer than 10,000. And with more than 10,000 write-ins still to be counted, Murkowski is confident of victory because she's been getting nearly 90 percent of the write-in votes. Murkowski would be the first candidate elected to the Senate as a write-in since Strom Thurmond in 1954, and she can't wait to see how it will all play out. SENATOR LISA MURKOWSKI (R-AK): This is a whole new world for me, and it will be a whole new world for my colleagues in dealing with me. 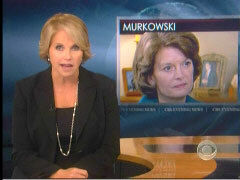 COURIC: Lisa Murkowski is back in Washington, and this time, she's making sure everyone knows how to spell her name. COURIC: Beaten in the GOP primary by Tea Party favorite and Sarah Palin-endorsed Joe Miller, in some ways the loss was Murkowski's gain, breathing new life into a candidate who assured Alaskans that federal dollars would keep traveling north. COURIC: The Republican establishment supported Miller, and now, Murkowski is trying to figure out where she fits in. Will you feel a little like it's your first day of school and you don't know who your friends are going to be? MURKOWSKI: Maybe a little bit of that. Who are my friends? Who are my real friends? COURIC: Part of a dying breed of moderate Republicans, Murkowski claims she's winning because she represents all Alaskans. MURKOWSKI: I do not pass the purity test that the Tea Party has set out. It's just as simple as that. But I don't think most people in my state pass that. There's a lot of people in Alaska that are pretty anti-government, but I think they would also agree that, well, maybe the best thing is not that we shut government down. COURIC: And, she says, the message she's hearing loud and clear is compromise. MURKOWSKI: I will tell you, I am not one of those who wants Obama to fail. If he does well, that means the country's doing well. We don't have time as a nation to spend all of what we do blocking. We have got to figure out how we get to a point where we can be sitting around the table and talking about these difficult problems and advancing some solutions. COURIC: Is that you holding Walter? MURKOWSKI: That's me holding Walter. COURIC: She's not shy when it comes to speaking out about another Alaskan outdoors woman, but minimizes the bad blood created when her father appointed her instead of Sarah Palin to serve out his term in the Senate. What's up with your relationship with Sarah Palin? Can you explain? MURKOWSKI: I'm still her Senator. I'm going to work hard to represent her, too. We don't really have much of a relationship. COURIC: You have said you would not support Sarah Palin for President because she is not worldly enough. MURKOWSKI: I just do not think that she has those leadership qualities, that intellectual curiosity that allows for building good and great policies. You know, she was my governor for two years, and I don't think that she enjoyed governing. COURIC: No matter what Palin does, Murkowski says 2012 is still a long way off, and she's certain of one name that won't be on the ballot. Would you ever throw your hat in the ring? That would really shake things up, wouldn't it? MURKOWSKI: A national write-in campaign, wouldn't that be wild? No, we're not thinking about this at this point in time. I am still counting votes in Juneau. COURIC: And Murkowski met today with Republican Leader Mitch McConnell to talk about her future. She believes compromise with the majority Democrats is possible on energy policy. As ranking Republican on the Energy Committee, she'll have a major role in trying to work out a deal.